I want to restart and reinstall Windows 10. But every time I go to Settings> Update and security> Recovery> Restore, it fails with this error ‘There was a problem when resetting the PC’ and then it got stuck during the process, if there is a solution to solve this problem? If this sounds similar or if you are searching fix for “there was a problem resetting your pc” error in windows 10 then you are at the right place. Lets see why this error appear and how to fix it. Every time something goes wrong when starting the system, Windows first starts in the automatic repair assistant to solve the problems automatically, if it fails, you should update or reset the computer. But in most cases, the update or restore failure will occur soon with this error message ‘there was a problem when resetting the PC, no changes have been made’. If you try to update, you will see the error message saying that there was a problem updating the PC and the changes were not applied. And if you are going to use the Reset function, you will see another error message ‘There was a problem when you reset the PC’. To know more about the true cause of the restore failure in Windows, you can open the command prompt and execute “dir c: \ / a: sh” (without quotes). Then you will see a folder “$ SysReset” in the root directory of unit C :. Open the file C: \ $ SysReset \ Logs \ Setupact.log to see the registry of Reset my PC in order to find out what the problem is. Then you can find the solution corresponding to the problem you face. 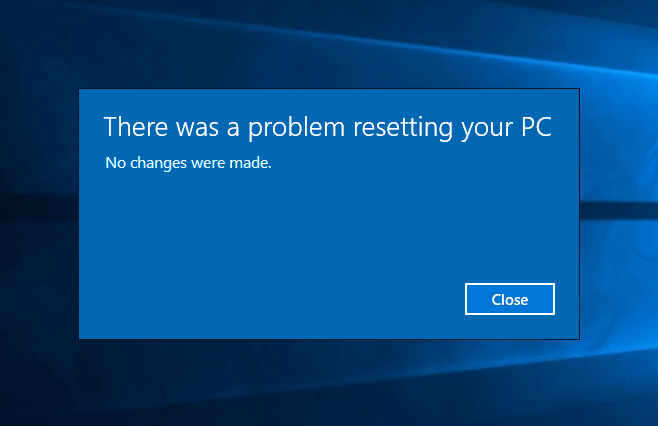 Unfortunately the problem of resetting Windows 10 with the error message “There was a problem to reset your PC” seems to be getting more and more common. Everyday more users are reporting on this problem and requesting help online. Therefore, we collect some possible ways that some users have confirmed are useful to solve this error. You can test them one by one, and the following solutions also work for Windows 8 and 8.1. 1. Go to Settings > Update and Security > Recovery > Advanced Start , click Restart Now. 2. In the new window, select Troubleshoot > Advanced Options > Command Prompt. 4. Now provide the credentials for the administrator account you chose in the previous step. Then close the command prompt window, which will take you to the Windows Recovery Environment screen. Select the Continue option to access your operating system. After restarting, you will see that you have already solved the error ‘There was a problem when resetting the PC’. 1. Click the following link to create an installation medium for Windows 10/8/8 using the Media Creation Tool. 2. Insert the installation medium that you have created and then restart your PC. 3. On the Windows installation screen, select Repair your computer. 4. On the Choose an option screen , select Troubleshoot . There you can use the safe mode. Select Advanced options > Reset this PC > Delete all . Windows 10 integrates a feature called Recovery Disk, with which it will be possible to restore the computer or make backup copies and reinstall systems when it presents some kind of error. For this use it is ideal to have a USB medium of at least 8 GB capacity. To start this process, enter in the Windows 10 search box the word “create a unit” and there we select the appropriate option. In the next window, click the option “Make a backup of the system files in the recovery unit”. Click on Next and then select the desired drive. Again click next. There, click on “Create” to start the process of creating the recovery medium. Click on “Finish” to close the assistant. Once the unit is created, we must configure the BIOS or UEFI of the equipment so that it starts from there. Press the F10 key to save the changes and once the system is rebooted we will go to the advanced start. In Solving problems, we select the option “Recover from a unit” and follow the steps of the wizard.